This course is a unique and comprehensive online course produced by experts, specifically for those wishing to start or who already run their own pet sitting or dog walking business. The course has been accredited by UKRS. UKRS develop and deliver top quality training courses and qualifications to meet the needs of employers and learners. Once you have completed the NarpsUK Pet Sitting and Dog Walking Business course in full you will receive certification from UKRS embossed with the National Association of Registered Pet Sitters and Dogs Walkers gold seal which you can show to prospective customers. We will also send you our digital emblem to use on your website and in your literature. 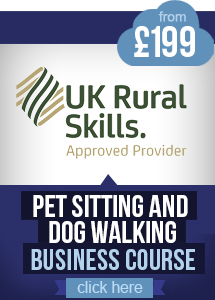 This course will help you to decide if pet sitting is the right career for you. On completion you will receive a NarpsUK embossed certification, a NarpsUK digital emblem which you can use on your website, stationary and any literature you send out. Some of the other subjects that are included within these modules are: Setting Prices, Taking Payments, Initial Consultations, Pet Transportation, How to get New Clients, Pet Sitting Insurance, Medication and Vaccinations, Flea Control and Dental care, What to do in Emergency Situations and more. The course is delivered online through an internet based course website. No special software is required, just an internet connection. The course is split into various modules which go through the required teach points and information with an assessment at the end of each module. Once you have completed all the modules there is an overall assessment of the entire course. The assessments are based on multiple choice answers and a pass rate of 75% is required to pass each module and the final assessment. The course comprises of 11 modules and a final assessment. Each module will take on average between 1-2 hours to complete with an assessment at the end. The final assessment will take around 30 minutes to complete. We estimate it will take around 20 hours to complete the course. You will have 12 months to complete the course once you have signed up.